I thought of titling this post as “How I finally managed to get my Gardenias to flower”, but this post is actually about so much more than just getting them to flower. I think for inexperienced gardeners (like myself) Gardenias are tricky. Its a labour of love to successfully grow Gardenias – personally I have found them far more complicated than roses. Roses are a dream if you pick the right rose for your location, follow the guidelines, use a bit of common-garden-sense and they will reward you pretty quickly. Not so Gardenias … or at least that is my experience. 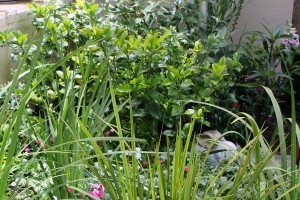 The eight Gardenia shrubs were planted in my garden 3 years ago, small fledgling plants, planted in what I now call my “Gardenia Bed” (yes I know, very unoriginal!). One shrub flowered that first year if I remember correctly, because I did manage to take one good photograph of a Gardenia bloom. But I also recall the bloom lasted only a day and then fell off, and the rest of the buds on that shrub all fell off without flowering. None of the others flowered. And so its been an ongoing battle with these shrubs. Never mind the flowers, the shrubs always look(ed) poorly and a few weeks ago I made the decision to give the remaining plants one last go or … into the compost pile. Well-drained, slightly acidic soil with a pH of 5.5 to 6. 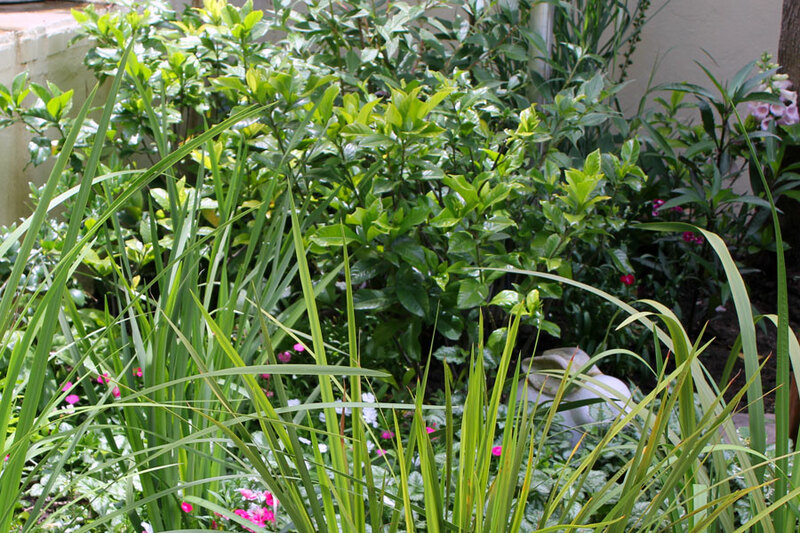 Water regularly – Gardenias like to be well watered but roots will rot if they ‘stand’ in water and buds will drop. If the plant’s leaves begin to yellow, spray with chelated iron. Epsom salts (magnesium sulfate) can also help to solve this problem. The Gardenias shrubs look a whole lot better and today, (imagine my excitement) I found to my delight that the first bud has opened! It was pouring with rain but I had to run outside and take a photograph as proof! 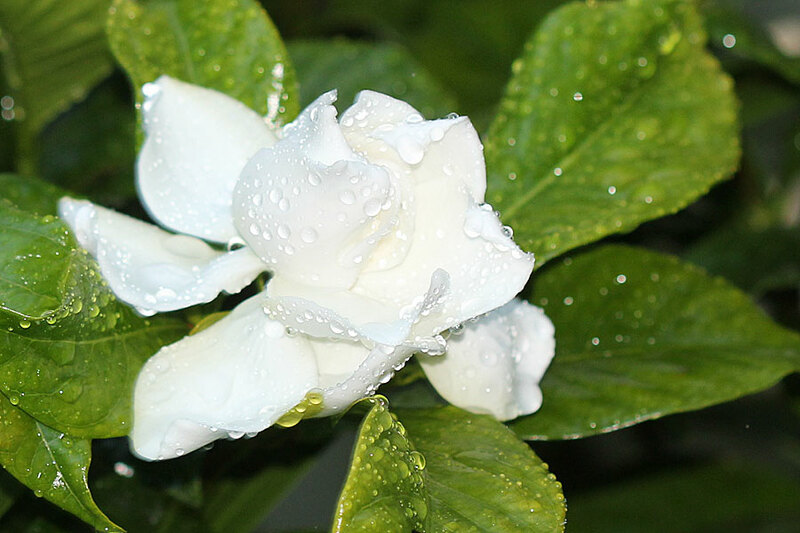 Gardenias Jasminoides – (Mine are Gardenia Jasminoides) – Gardenia jasminoides, (common gardenia, cape jasmine or cape jessamine) is a fragrant flowering evergreen tropical plant. 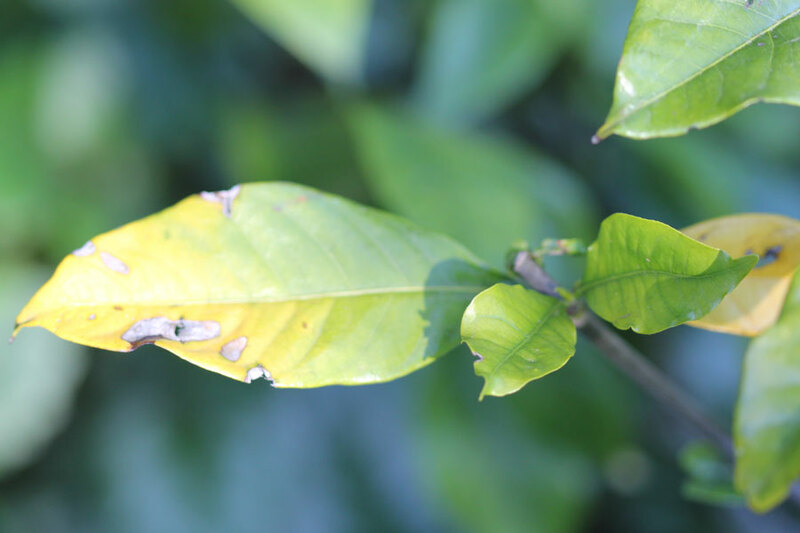 With its shiny green leaves and fragrant white summer flowers, it is widely used in gardens in warm temperate and subtropical climates. It has been in cultivation in China for at least a thousand years, and was introduced to English gardens in the mid 18th century. Many varieties have been bred for horticulture, with low growing, and large- and long flowering forms. Just catching up on my blog reading (too many blogs, too littlt time!). I have tried to grow gardenias as pot plants, i am so envious of anyone being able to grow them in the garden and get them to flower. I found them very tricky and gave up. Wonderful photo. Pity we can’t smell it too! Congratulations on coaxing a bloom. 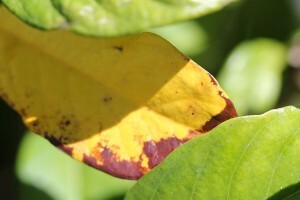 Here’s what I know about gardenias: They are going to have yellow leaves at times…. I wrote a lot more about growing gardenias, so much that I decided it would be better as a post on my own blog with photos after bloom day is over. Congratulations again on your blossom. Here’s to many, many more. Curtiss Ann just told you that her son has one that blooms despite neglect while she loves hers to death. !!!!!!! !–that’s me clapping for you. I soo understand. I live in the heart of gardenia country in zone 8b USA, and I have killed a number of gardenias. I currently have 6, all different varieties, alive. Different areas of the yard, too, seeking the best spot. I adore the scent of gardenias. I am determined and appreciate your tips. Yet, let me relate that my son has a gardenia at the rear corner of his house, next to the stairs where children play, and the baking western sun shines on it all season. He never waters the bush, although it is at the drip line of the roof. It made it through our drought, and bloomed and bloomed, even with yellow leaves. It is now taller than I. Makes me want to slap somebody. Whew I have mixed results with this plant. While the blooms are incredible and amazingly fragrant, I’ve only got it to flower once. Lots of bud drop, slow growth and general lack of luster. Nice tips! I’m wary of planting mine outdoors so mine lives in a pot, maybe next spring I’ll let it hit the soil. Great shot btw! Hi Nat – I hope mine continue to do well. So far the bloom is still beautiful on the plant and another two buds on that plant are about to open. So …. so far, so good. But I’ve had such poor results that I’m still holding thumbs here that my “new Gardenia formula” works. PS: The fragrance of that one bloom is quite something! I never realised how strong and beautiful Gadenias smell. Wow!! well done. I think I would have given up long ago with these – fussy plants and me don’t see eye-to-eye (one ticket to compost heaven) I have to agree with Alan. 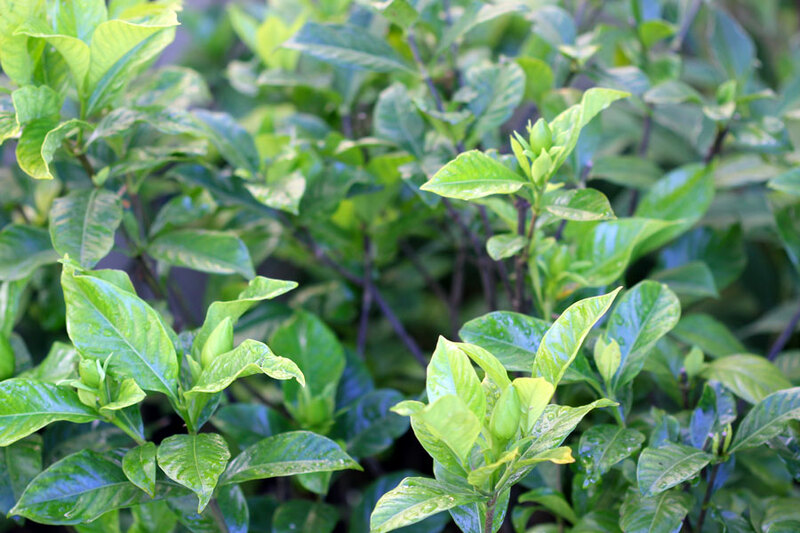 Looks as if your gardenias have given you five stars for your services. I only became aware of gardenias after reading blogs, now I fantasise about them, I imagine they smell like jasmine. Yours is beautiful, even more so because it played hard to get. I would put them on my wish-list but I don’t think they would grow well in the UK. In a way it’s for the best – is there a saying … ? : Never buy your dream plant. hehe, I like that saying because it rings true! My “favoutrite favourites” don’t do well in my garden! The scent of this Gardenia is like nothing I imagined! It is quite something wonderful. 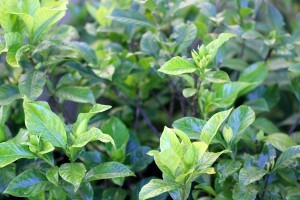 Not really Jasminey though, smells like the “Gardenia bubble baths” one can buy, only about ten-gazillion times better!. Congratulations on your blooms! I just love the smell of gardenias, and I see them all the time in plant stores here in NC, but I’m quite sure that they would not like my heavy clay, alkaline soil! Hi Indie – so interesting. Jess who commented below is in South Carolina and she says they grow like crazy there. Maybe they would like your garden. But be warned, they are mega fussy. At least thats my experience. I never had any luck with them ever. They just require too much humidity so they could never leave the greenhouse and that was no fun. Congats on yours blooming. I do love them and their fragrance. Donna, their fragrance is wonderful! I can’t get over how beautiful mine smells!! IMO one of the things about gardenias is they are much more climate specific than they are marketed. Where I live they literally grow in median strips. And in pots people have lining their steps, and in full shade, and in part shade, and even in what should be too much sun on occasion. Then I see some people growing gardenias in locales(or trying to) that would be akin to me deciding to grow lilacs here and wondering why they never bloomed (EVER! ), or why cacti always look half rotten here. Of course I have little proof of this, but I suspect that because the bushes don’t die or look horrible they get sold places where they are not easy to bloom shrubs. Here, like I said, I see them in all kinds of conditions blooming like crazy, but what they seem to mostly get are: part sun (morning), extremely good draining soil (sandy), humid humid humid: all the time, no real winter, soaking rainfalls followed by mostly sunny conditions (thunderstorms) through most of the year. I feel bad telling you that mine I bought bloomed fully each and every year sorry. But like I said, I can’t grow so many things that are snaps for climates both north and south of me, it all comes out in the wash! Hi Jess, hmm, lots of food for thought here. Its true I don’t see them flowering curbside which usually is a good indication of what will grow without attention in a garden. I haven’t really questioned too much how they do in the area – but they are sold here in the nurseries as if they should be flowering non stop – which is why I assumed I was doing it all wrong. Well thanks! I love my little garden, and its come a VERY long way from whence it came. I agree with you and everyone else on the gardenias that they are supposed to be easy, but I think unless you are in the right spot you are going to have to work for them, and get mad at those of us who treat them like weeds The do have the most awesome smell of any garden plant, to me, far better than both roses and jasmine, both of which I also love. So they are definitely worth a shot!!! 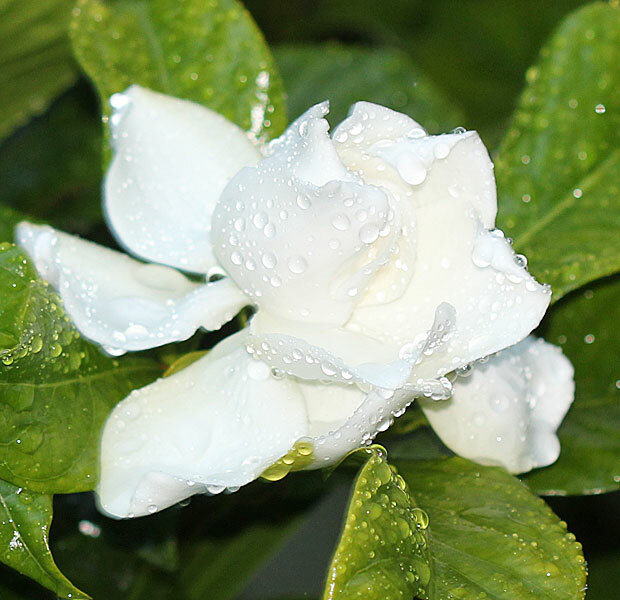 Your gardenia is beautiful, especially with those rain drops! Glad they finally bloomed for you. Gardenias can be so frustrating, but when they bloom, all is forgiven. I think it’s their glorious scent that makes us forgive all! Hi Holley – That is so true – When they bloom, all is forgiven! hehe. Nice work! I think if you use organic fertilizer regularly you’ll have much fewer issues with these. I don’t grow them myself, but probably would if I had the right climate. And didn’t have deer. And had the patience for fussy plants. Hi Alan – I think you hit the nail on the head. I used to use “other” fertiliser. That is one big different thing I did this time around with the Gardenias. Only organic fertiliser. Maybe thats the secret! I don’t really have much patience at all with fussy plants but the though of 7 big bare patches if I removed them, spurred me into this one last ditch attempt with them. So far, so good, They get to stay. For a while anyway!